In the common understanding, bridges do not encourage people to stay on them and occupy the space. They are designed to cross, but not to stay. The question is could we rethink the purpose and functions of bridges, take advantage of the knowledge we have nowadays and implement it in a way that makes the bridge structure assets with a program to create a hospitable urban environment. 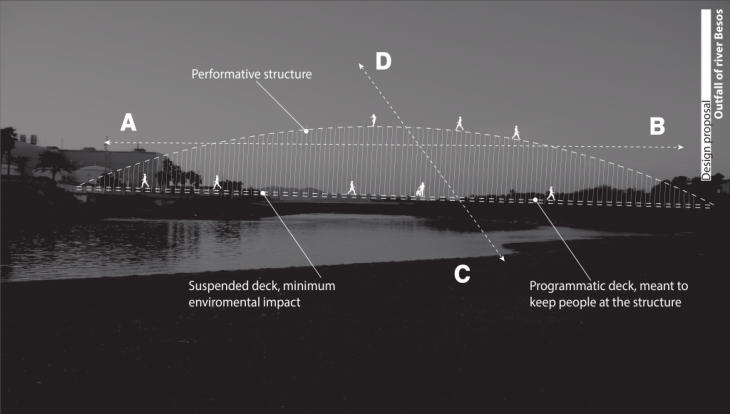 This research is aiming to reveal how contemporary bridge structures are developing their basic function, creating program and becoming a merging link between two points, thus creating valuable hospitable urban environment, that is meant to keep people there. 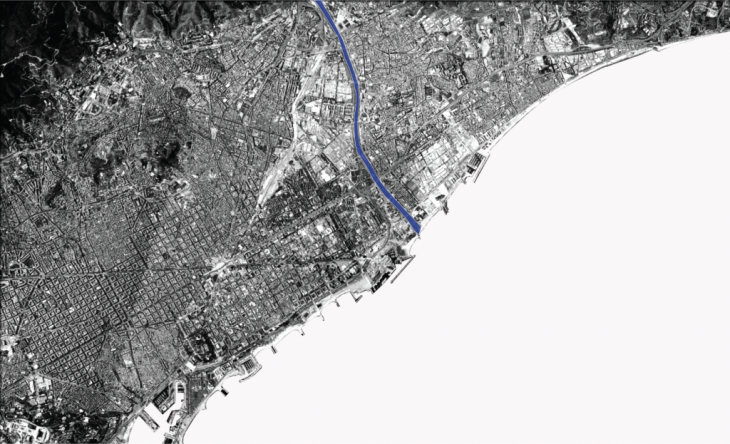 The aim of this thesis is to develop a bridge project at the outfall of River Besos, north of Barcelona. It is exploring the potential that such an infrastructure has to create a unique specific public space, like no other urban element. Infrastructure, that is not anymore only to connect spaces, rather than producing spaces. A bridge connects locations. It is represented and remembered as such. This is not the only attribute that gives meaning and significance to bridges. Other layers of significance unfold as the materiality of a bridge is distinguished from its location. When the bridge is understood as a separate entity independent of the sides, the physical existence and appearance of a bridge become significant on their own right. Some bridges also carry the property of inhabitation. Fishermen often have their regular spots staked out. For some inexplicable reason, the mentally ill are drawn to bridges as well. There is something about bridges and they are sometimes seen as bigger barriers than regular streets, even if there is no chance of causing a delay. People will not hesitate to take a 10 minute drive on an highway which has the same length of road without exits as even the largest of bridges possesses. Other times bridges are seen as the only way to reach a destination, and therefore bridges are a way to overcome obstacles. They represent transitions. “Crossing over” is a euphemism for taking that journey from life to death. Perhaps that’s also why so many people use bridges when they’ve made the unfortunate decision to end their lives. Bridges have always attracted attention, throughout history, they`ve been a point of centrality in many places and occasions. That is something to consider when we ask the question what is the bridge as purpose, functionality and program. Comparing different cases in similar conditions and analyzing them, one thing comes to mind. Bridges are acting like a funnel for people and traffic, roads are narrowed down to a single connection, that takes all the surrounding traffic, both pedestrian and vehicle. Because of the bridge`s function in relation to the surroundings it acts as an attraction point and people/traffic are funneled through it. That makes the bridge very desirable point of interest, people not only go there because they are attracted by the place, but often because it`s the only way to cross an obstacle. For example people go to malls by their own choice, they are not directed to go there, which is the case with bridges, which are often used, because it’s the shortest, fastest and sometimes only way to get to the desired destination. Historically bridges have been used par excellence as a connection, hub, infrastructure, but not so often as a public space, as a programmatic space, as space that is meant to keep people there. We have only a very few examples throughout history of bridges, that had a program. Ponte Vecchio in Florence-Italy 1345, Ponte Rialto in Venice-Italy 1591, Charles Bridge in Prague-Czech Republic 1402 , The Kapellbrücke in Lucerne-Switzerland, 17th century, The Covered Bridge in Lovech-Bulgaria 1874, The Krämerbrücke Erfurt-Germany 1472, Galata Bridge Istanbul-Turkey 1994. The reasons for this historical fact vary, from legal obstacles to not fully understanding the potential of this potentially public space, which has the ability to provide many advantages to host a program. Also a reason, that causes bridges to remain mostly as a infrastructure tool is the appearance of cars. When cars and vehicles become used in our daily life, that distances the public from the bridge as a structure, as space to enjoy the scenery while crossing it. Cars become capsules, that are protecting passengers from the surrounding environment, passing quick and meaningless. Mobility becomes fast and not dedicated to the environment around but only cover needs of transportation and is not anymore an experience, that connects us with the surrounding that we are passing. All that leaves the bridge an unexplored territory. On another hand contemporary bridge proposals more often include a programmatic space for public use, visible from the Timeline, a lot of the new concepts for bridges are dedicated to the potential programs, that a structure like this can host, depending on its location and surroundings. The bridge’s inhabitation adds layers native to the materiality of the bridge. It then begins to shelter and accommodate certain activities besides enabling passage over an obstacle. It contains еаsе as well as allowing movement. It attends to inhabitants in addition to passers by. This dual existence is conductive to raising questions about its perception at two levels. Although the property of inhabitation is not related to its ‘bridgeness’, the inhabited bridge this way becomes an inspiring object for relating exterior presence and interior essence. Could we rethink the bridge as a function and purpose, using advanced architecture knowledge, and take advantage of its location by either influencing the environment in a positive manner, or extracting green energy from it, by beneffiting from existing forces around them. Bridges are placed at unique locations, that could be beneficial for the structure, or the structure could become beneficial to the surrounding environment. Bridges as we know them, always cross the obstacle, but are almost never connected to it. Never influence it, despite the big advantages, that could be extracted from the structures location. All roads lead to a bridge, a network of roads is narrowed down to a single connection – a bridge. Bridges act as a natural funnel and people are drawn by lack of options to this point. This factor makes such an urban link a point of huge importance. What better place to make a space in favor of the public, area that is a pleasure to inhabit, to spend time on and explore in full manner. The bridge is a spot that gives the visitors a new point of view, a new perspective, new options. Rather than passing through people would be only benefit if have the chance and conditions to stay and enjoy the man made link to the other side. 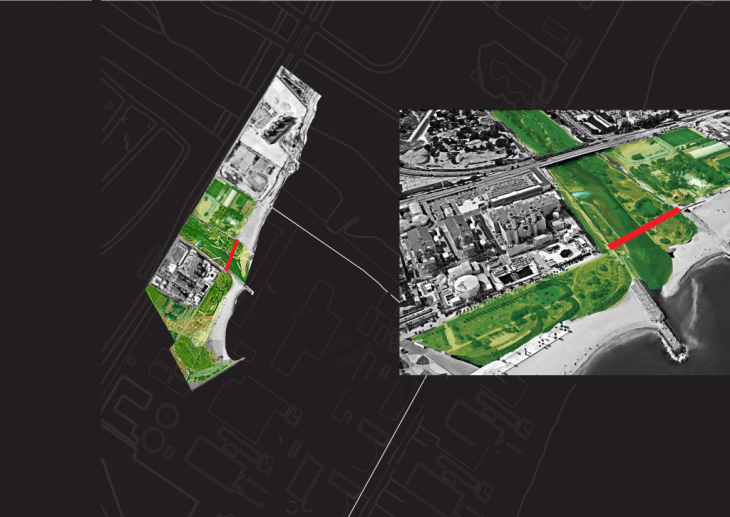 A design dedicated to the conceptual innovation to create a merging link between two points, thus ensuring a hospitable urban environment is a key point of interest in this research. Exploring the opportunities how to create not a link, rather than space. 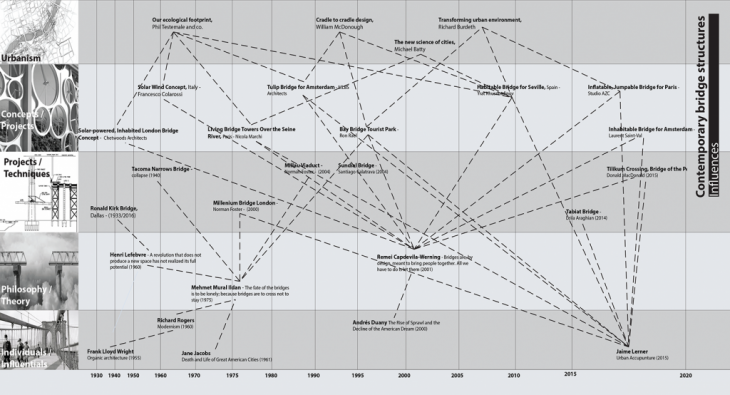 Looking at bridges throughout history and analyzing all the aspects that have influenced the contemporary bridge proposals this research is aiming to suggest a proposal bridge. The territory of interest is Barcelona city. Barcelona has an interesting location on the Mediterranean coast. In a mental way it is organized between the sea on east, the mountain Collserola on west, river Llobregat on south and river Besos on north. After looking closer at both rivers, Besos is the one attracting attention. Along the river is one of the poorest area of the region. 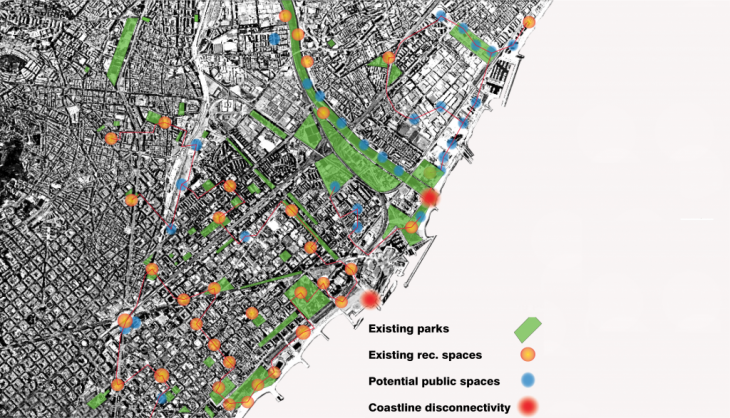 After urban analysis of Barcelona, coastline analysis, the outfall of river Besos was concluded as appropriate spot of analysis and further development of design proposal of a pedestrian bridge. 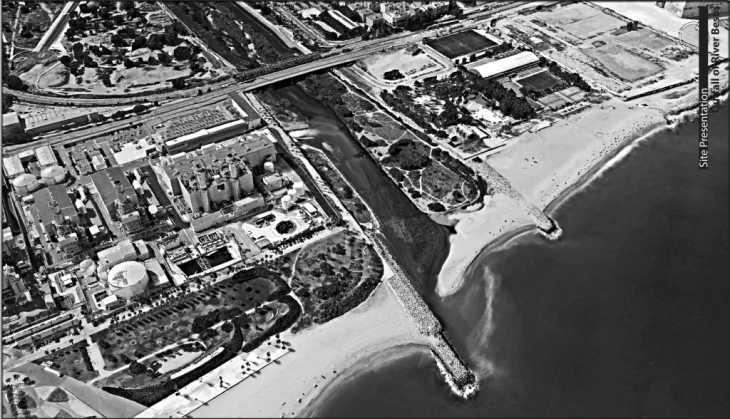 The site area was chosen as most interesting and of big importance for the area of the outfall and the whole coastline of Barcelona, Badalona and San Adrea de Besos. 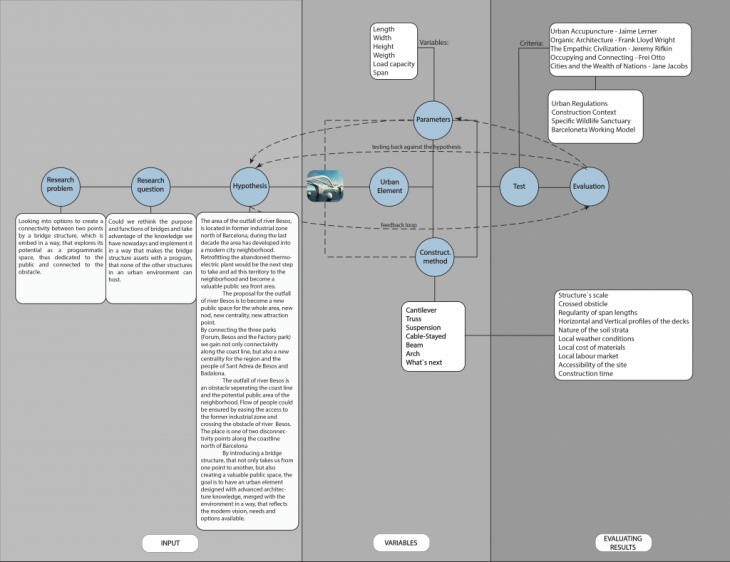 Looking into options to create a connectivity between two points by a bridge structure, which is embed in a way, that explores its potential as a programmatic space, thus dedicated to the public and connected to the obstacle. Could we rethink the purpose and functions of bridges and take advantage of the knowledge we have nowadays and implement it in a way that makes the bridge structure assets with a program, that none of the other structures in an urban environment can host. 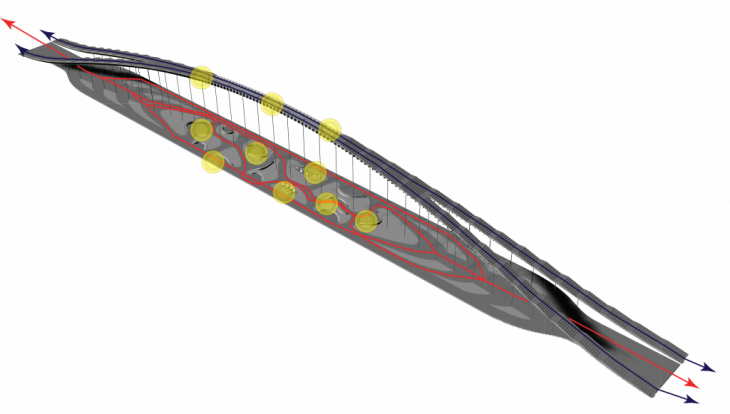 By proposing a bridge structure, that not only takes us from one point to another, but also creating a valuable public space, the goal is to have an urban element designed with advanced architecture knowledge, merged with the environment in a way, that reflects the modern vision, needs and available options. 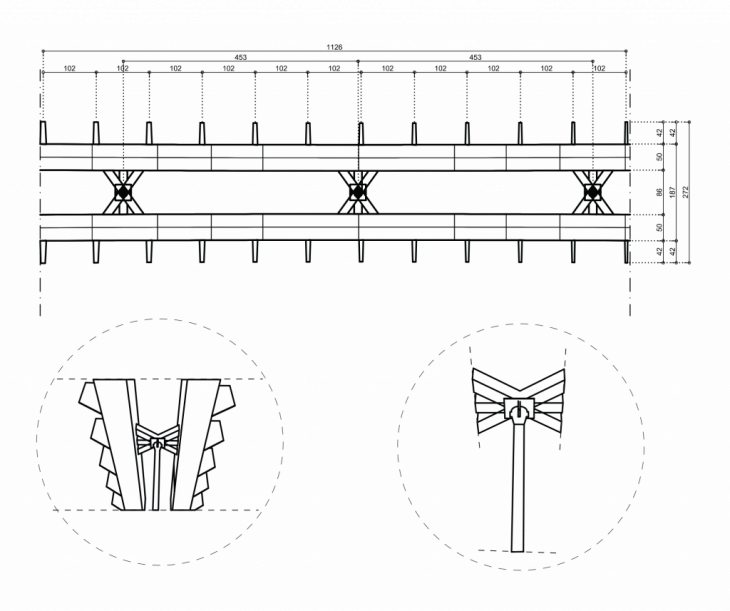 The diagram shows the relevance between the factors, which have influenced the contemporary bridge structures. 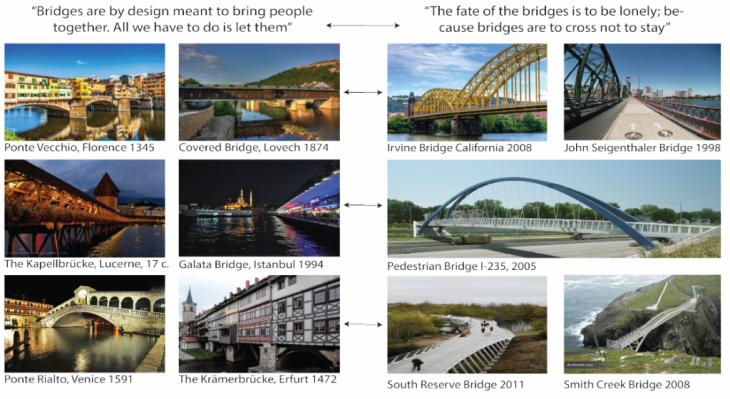 The outcome, which results is up-to-date bridge structures, not only for new designs, but also retrofitting existing ones into programmatic spaces and dedicating them to the public. This collaboration between urbanism/concepts and projects/Techniques/Philosophy/Individuals is drawing the picture of the contemporary looks of bridges. All the factors collaborate in a magical way to create beautiful, sustainable structures, spanning huge gaps, challenging our minds to ask the question “how was it built”. Thinkers and materials work together as factors influencing the future of bridges. The map shows the large scale intervention sites during the passed decade. Large areas of the city have been transformed in favor of the public. 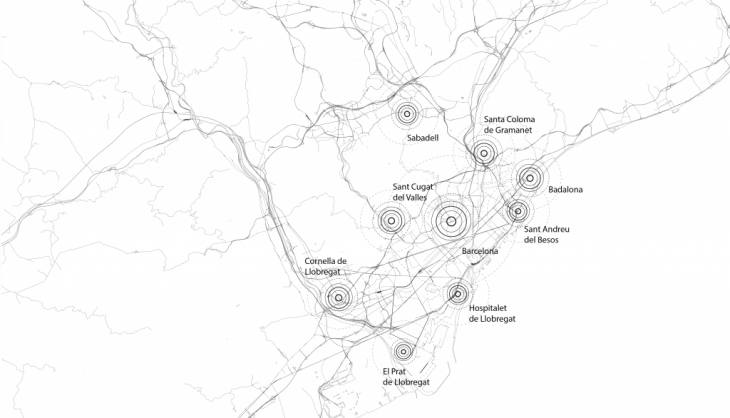 From the map is visible how north-east part of Barcelona has been a point of interest for the big part of those interventions. The whole riverbed of Besos has been retrofitted, the coastline along the city has been totally redone, new parks and public areas have been added to the existing infrastructure. One thing is obvious, the area north from river Besos has not been somehow neglected and not too many interventions have occurred. 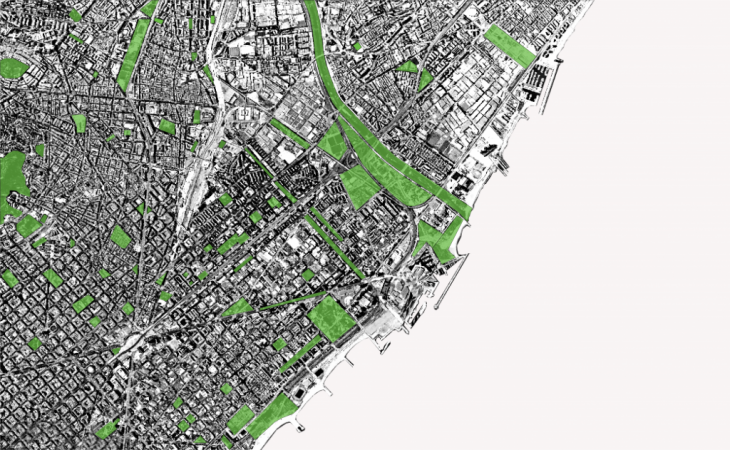 Mapping green spaces in the city of Barcelona is showing us how the recreational territories are spread along the city. 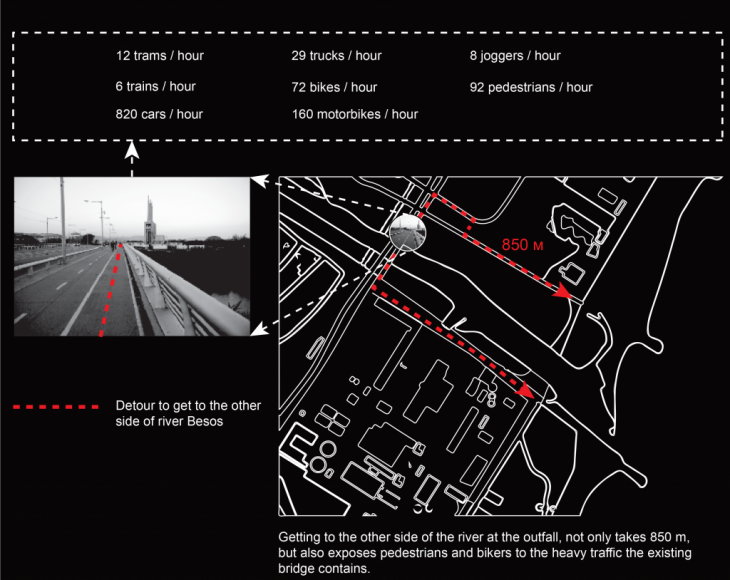 Looking at the area of river Besos, shows us that this is an area, which has more green spaces than any other area of the city and respectively is most common for pedestrian access. The area of the river has been retrofitted and is currently a large park along the river bed. The park is an attraction point for recreation for the whole area on its both sides – San Adrea De Besos and the north part of Barcelona. 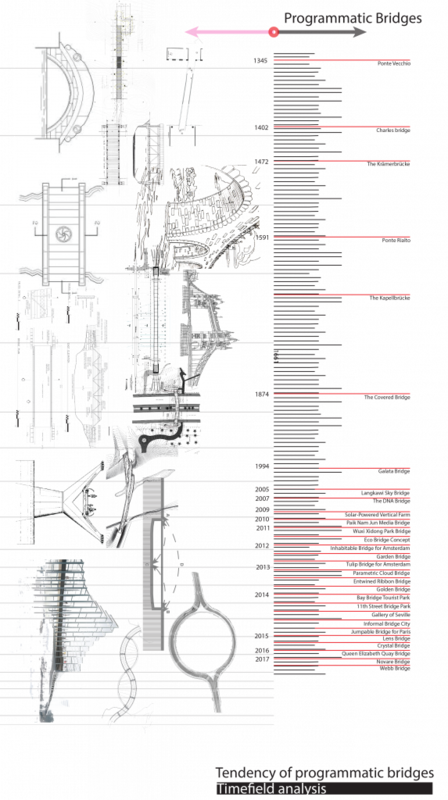 This map aims to locate and highlight the relation between existing infrastructure and potential public spaces. Where we could intervene in a positive manner and what effect that would have in the bigger scale of the city. With small changes to a community space to accomplish transformative impact, a park, block or a building can have an outsized effect on life in the surrounding city. The map clearly shows, that potential public spaces are desirable along the river and a great opportunity for further development. 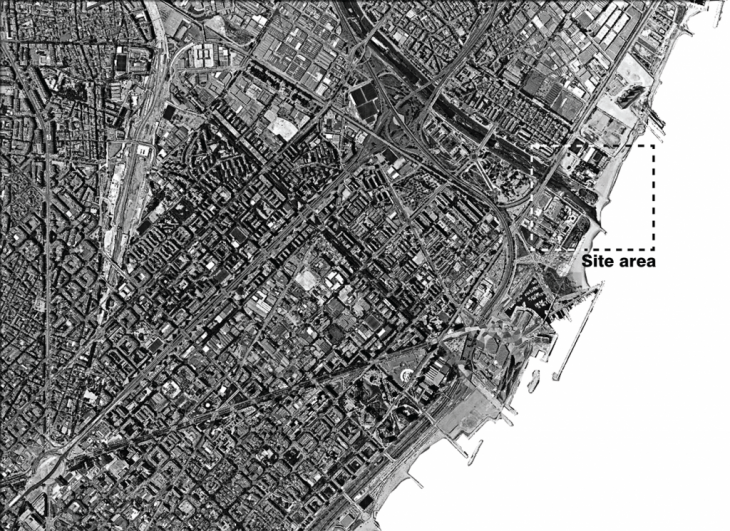 Looking at the area of Barcelona, we can find out, that Barcelona was founded later than her neighbor Badalona. What we can discover when looking closer to the history of the region is, that the Mediterranean coast is organized in multi-center organization. 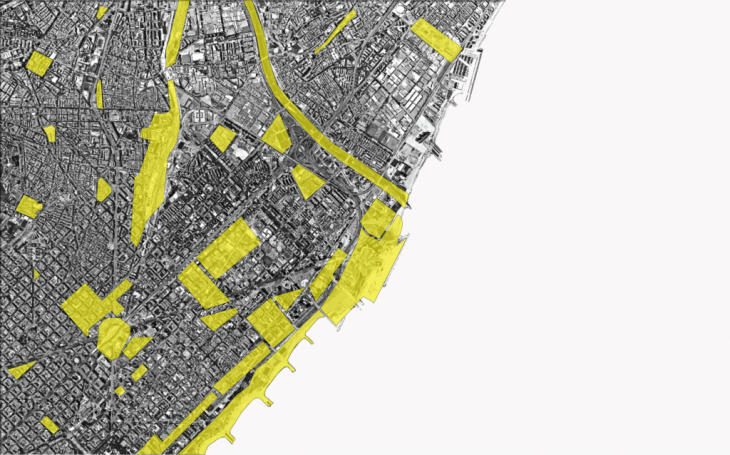 This creates an urban continuity along the coastline and inland. Along the river Besos is one of the poorest areas of the region. 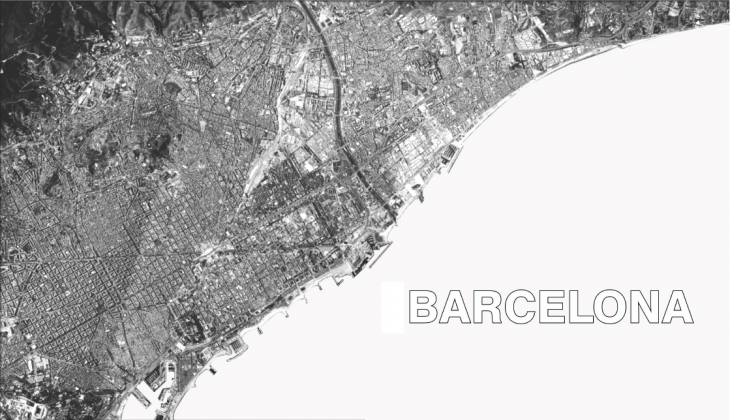 In a mental way Barcelona is limited by the sea on east, the Collserola mountain on west, river Besos on north and Llobregat river on south. 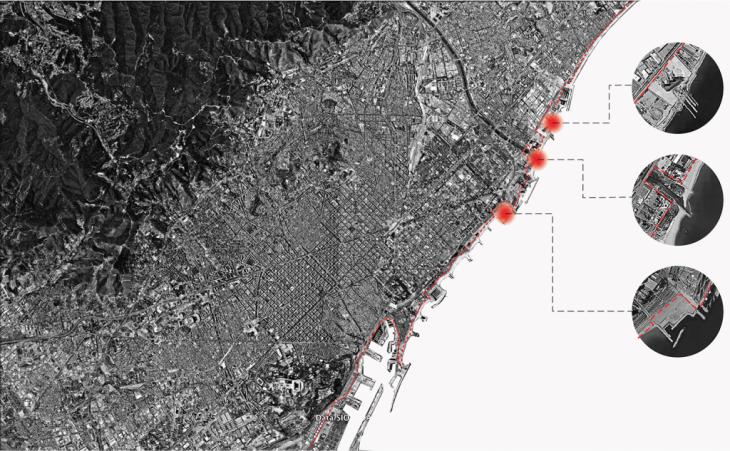 This map shows the points of diconnectivity along the coastline of Barcelona. The most southern point has been currently retrofitted and works are done following a design meant to let people through and not disconnect them from the coastline. 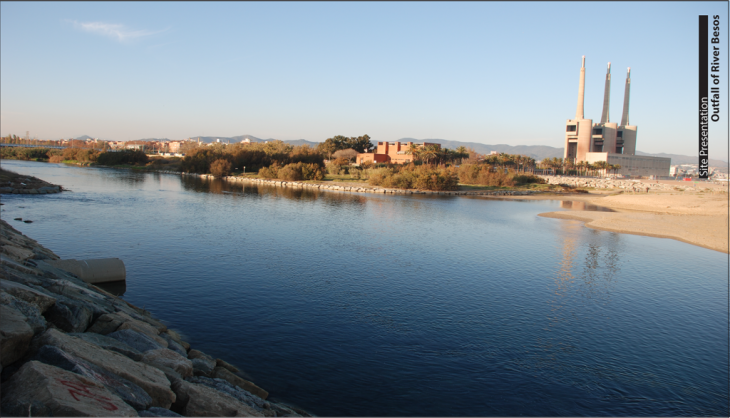 The other two points of disconnectivity are at the north border of Barcelona – outfall of river Besos and the old Thermoelectric plant, which is currently desolated. Those points are isolating the public from the coastline and directing people inland. 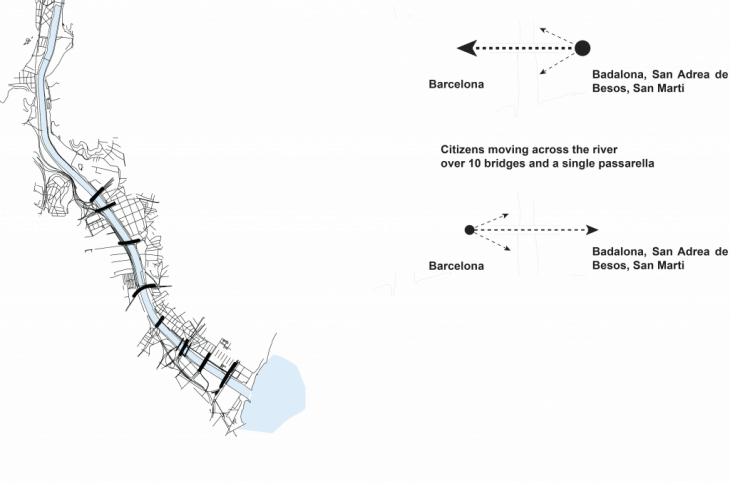 This diagram shows the traffic over the existing bridges along the riverbed. Clearly commuters from Badalona and San Adrea De Besos are more often going towards Barcelona than the opposite. A lot of people who live on the north side of the river are working during the day in the capital of the municipality. If we would like to continue our walk north along the coastline, we would have to take a detour and use the first available bridge, which is about 850 m of going inland and back towards the beach. The existing bridge is heavily loaded with traffic of all sorts, including trains and trams, trucks and cars. That makes going to the other side of the river a difficult and unpleasant activity, which many people avoid and river Besos is considered the end of the coastline for people coming from Barcelona. Traditional bridge concept vs. proposal concept. Traditional concept is the one, where the user is taking advantage of the bridge solely as the fastest route to go to the other side. 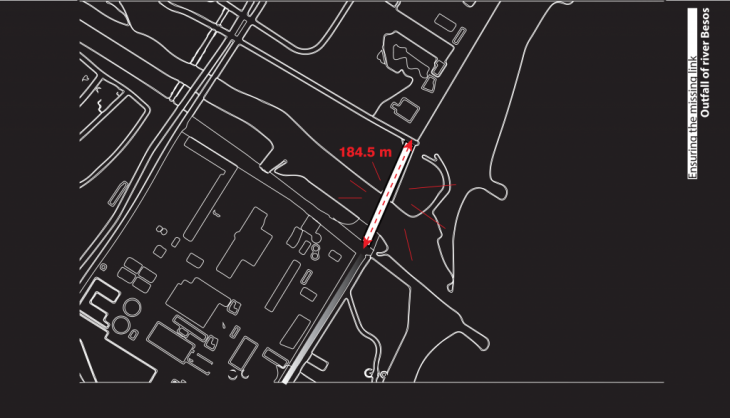 The bridge is having a single function of a infrastructure link, that is not meant to be stayed on, explored or to be of any sort of public space. The proposal on another hand has the exact opposite goal, to make the users spend time on the structure, explore it, see the area with “different eyes” from a different spot. And to create a public space, where the public goes anyway. We are looking at designing a structure, that is first of all hospitable for the public. 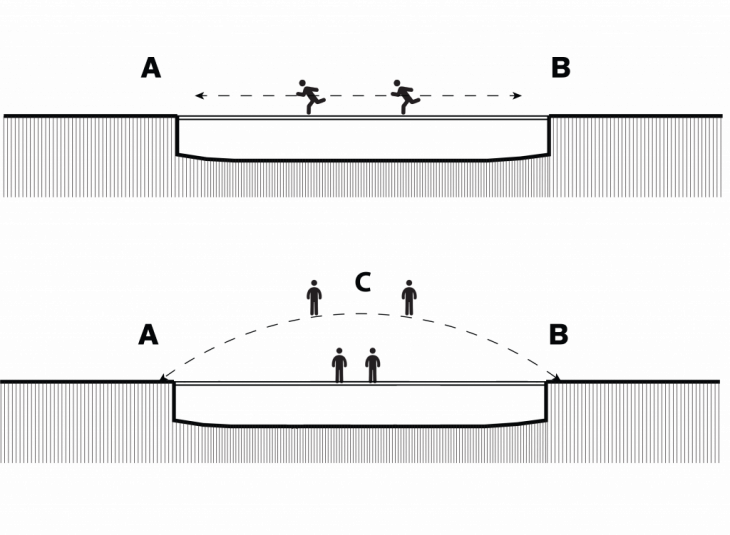 So that people who use the bridge to go to the other side to be provoked to stay and enjoy the options, that such a structure could provide. And not only that, but also to have a totally explorable structure, that has minimum to no restrictions for the users. 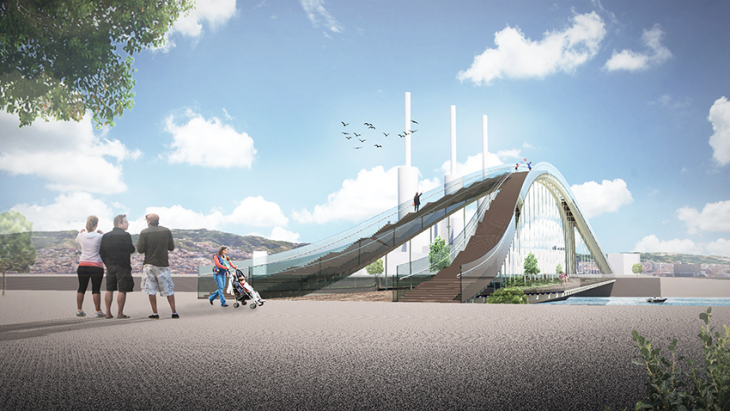 The aim is to make the bridge a point of interest, a new centrality for the region. The location is of big significance. 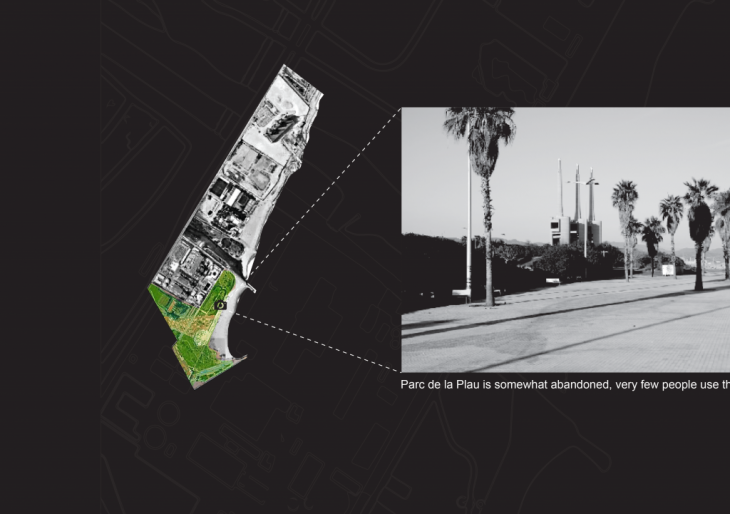 The proposed bridge would connect two existing parks on both sides of the river Besos – Parc De La Plau and Parc Del Litoral, bridging over the third park De La Ribera – along the riverbed. 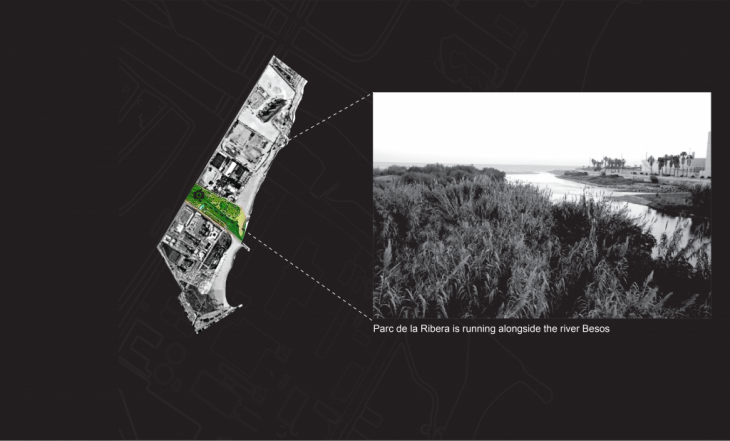 The riverbed is a preserve area and no interventions are allowed. Which narrows down the options of construction methods, which we can choose from. 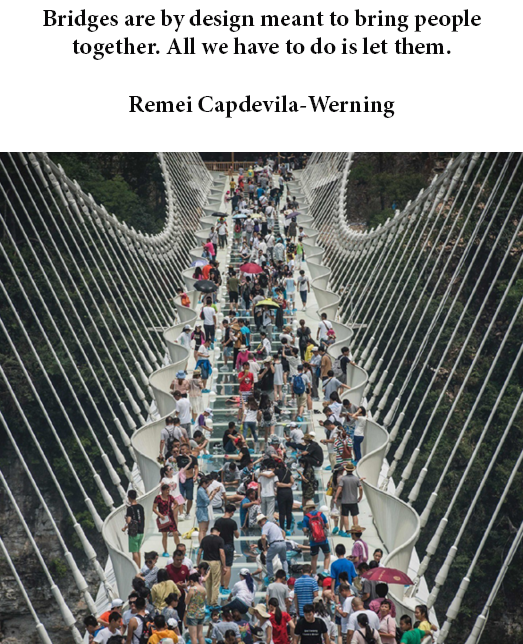 To span the width of the riverbed – 184.5m without interfering with the preserved area of the riverbed, the construction method had to be chosen between cable-stayed and suspension. 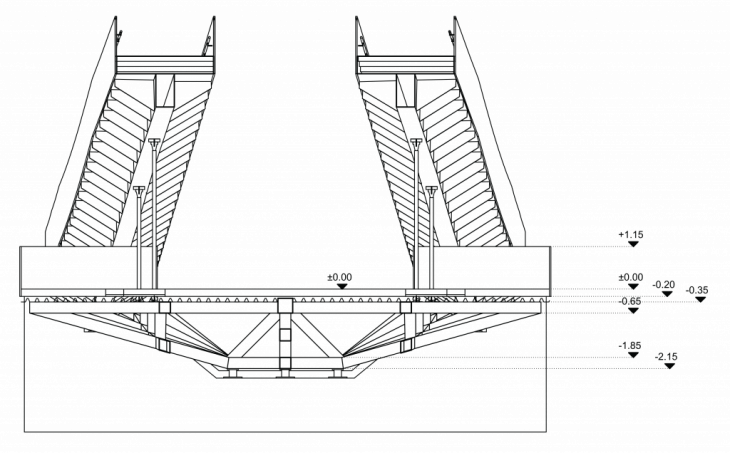 To follow the concept and make the bridge a totally explorable structure, the chosen method was to design a suspension bridge, with usable construction for public needs. Usually the construction of a bridge is not part of the area accessible for the users. The aim here is to give the public a new view, new horizon and challenge. 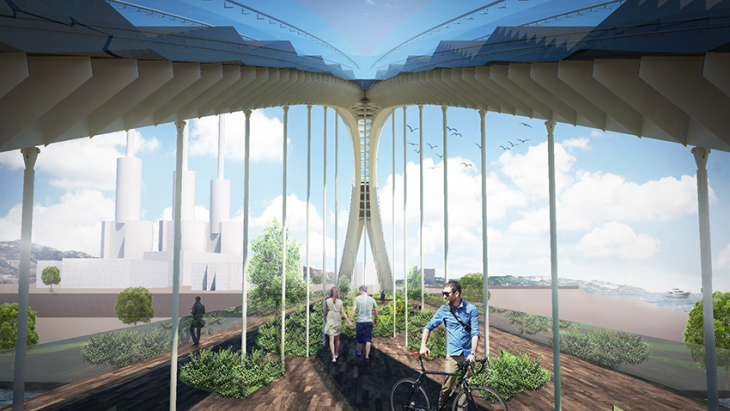 As the bridge is bridging between two existing parks, to create a merging link between them, the deck would be a park-recreational area as well. public, by providing areas for recreation, benches and lounge chairs. The wooden deck would, give a natural warm feeling to the users. following the angle at which the arch is curving. Then the arch finishes with a glass floor deck, that reviews the structures insight. Glass railing was chosen to create less visible boundaries. The arch is explorable and the only way up is taking the stairs, which is challenging to the users. The deck on top of the arch would treat well the ones who dared to go up the 124 stairs. 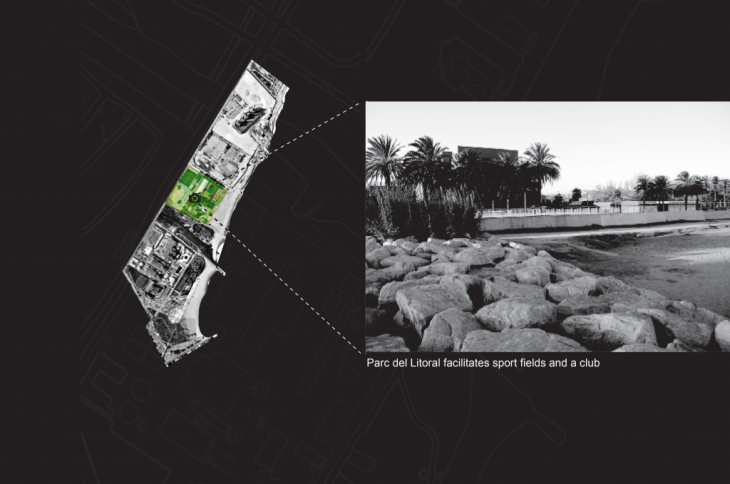 A new perspective and new view of the whole coastline and riverbed would be the award, plus the health benefit from being active in urban environment. 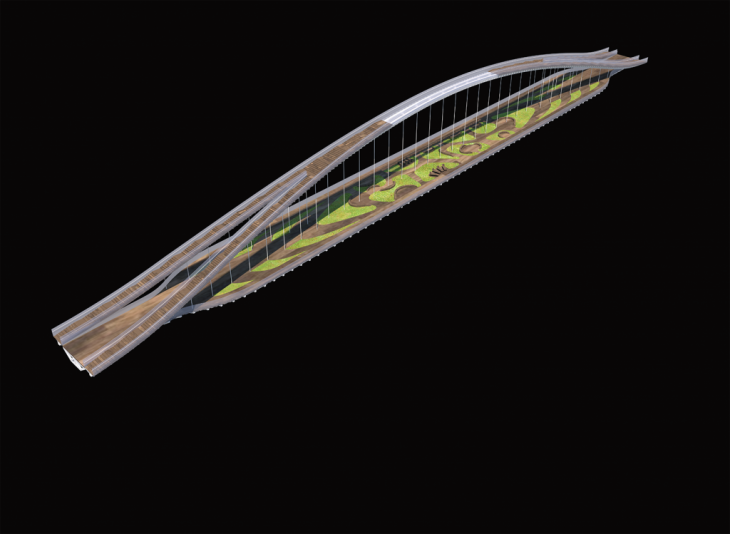 The concept behind the design is in tight relation with the construction skeleton of the bridge. 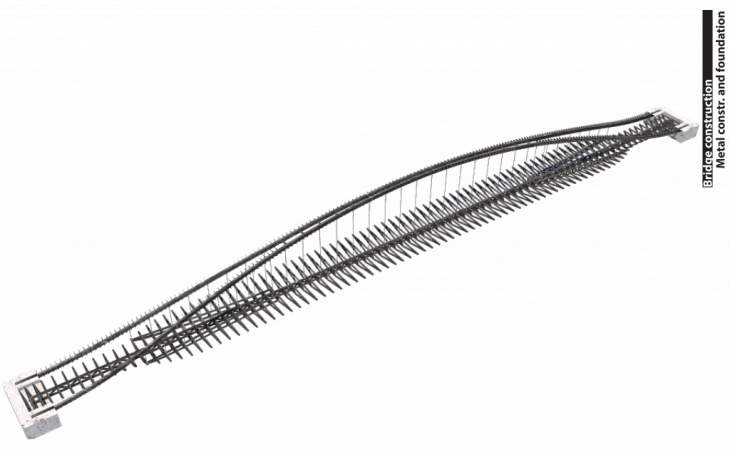 It is based on two suspension arches, starting at the ground they are apart and come together at the tip, then going down again by slowly separating and leaving space for the deck to come inbetween the arche`s arms. Each of the arches is designed with a main beam, closed profile 500/900mm. 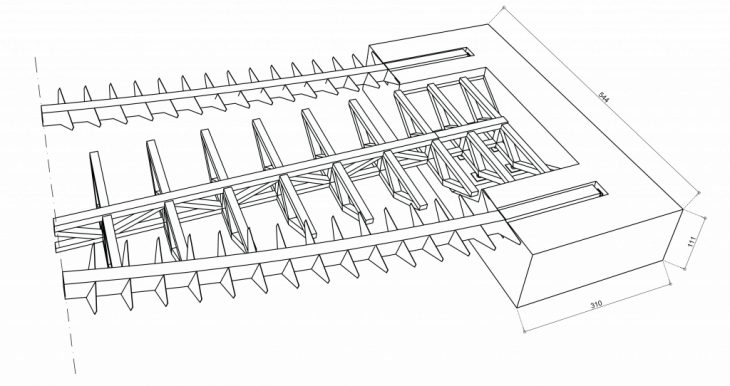 On both sides of each of the beams are placed metal, triangular ribs, together they built the arches skeleton. 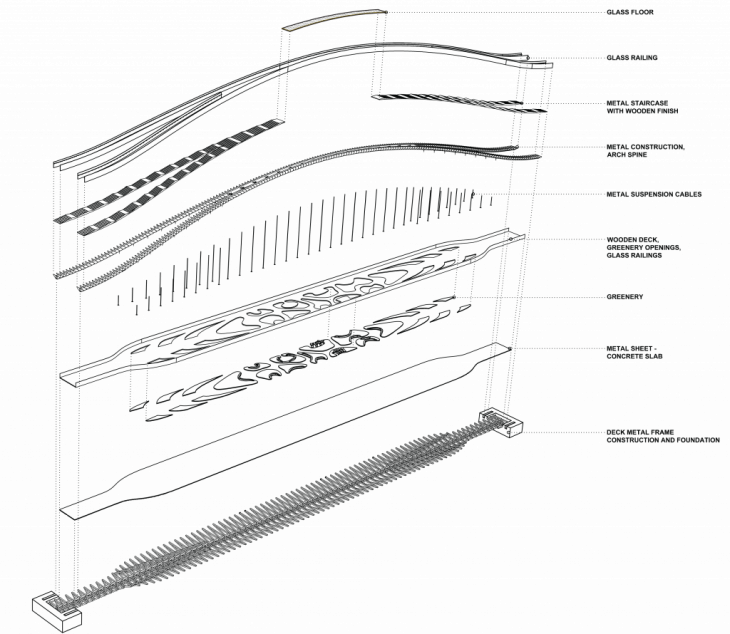 The ribs ensure the possibility to build the staircase over the arhes to take people to the tip. The two arches are suspending steel cables to support the deck. This way the arch structure and the deck crossing between the two sides of the arch on each end, start functioning together as one. The deck itself has its own structure to support it. 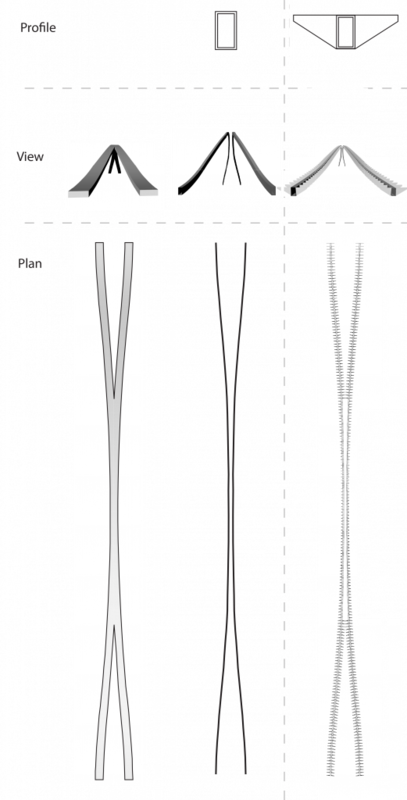 It is designed with a central, longitudinal spine – a metal truss. This metal truss is supported by 49 metal ropes suspended from the arch. 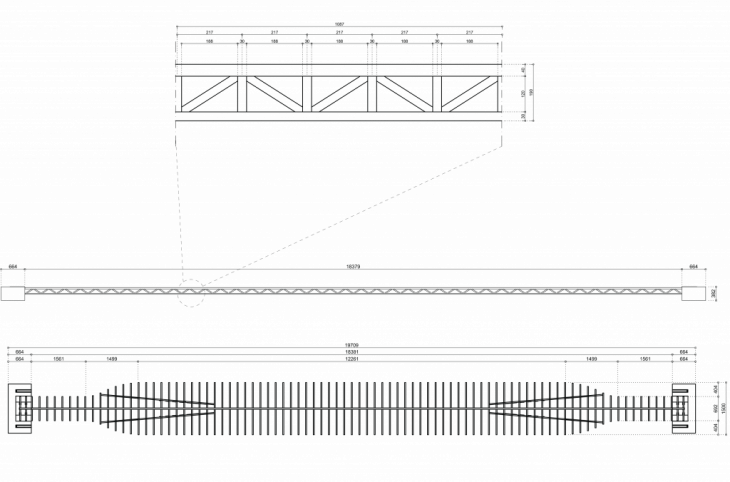 To build the platform of the deck, there are metal trusses acting like ribs. The top of the arch has a glass floor, it lets the users see the actual construction of the arch and how the suspension cables are connected to the arch and carrying the load of the deck. Also gives the visitors the feeling of levitating. The stairs on both sides of the arch are meant to bring people to the top of the structure and give them a new perspective of the area. So, what are the benefits of taking the stairs? From an individual perspective, climbing the stairs burns seven times as many calories as waiting in the elevator. Put another way, a trip up four flights of stairs is the equivalent of a 10-minute walk. Taking the stairs is also an environmentally friendly choice since elevators account for up to 10 per cent of a building’s energy use. Stairs are factor, that improves public health. The idea is that stairs offer a free source of physical activity that busy people can integrate into their day. It’s an appealing option for anyone who isn’t looking for a celebrity-endorsed gym. This design offers an opportunity to rethink physical activity but also questions the ways, that everyday spaces like stairs present benefits to some and barriers to others. Latest statistics suggest, that the population of the city is increasingly inactive and spends an average of 69 per cent of waking hours doing sedentary activities. Facing similar statistics the City of Boston launched a public health campaign in 2008 to encourage physical activity by increasing stair use. _The stairs follow the curvature of the arch, which has varying angle all the time. 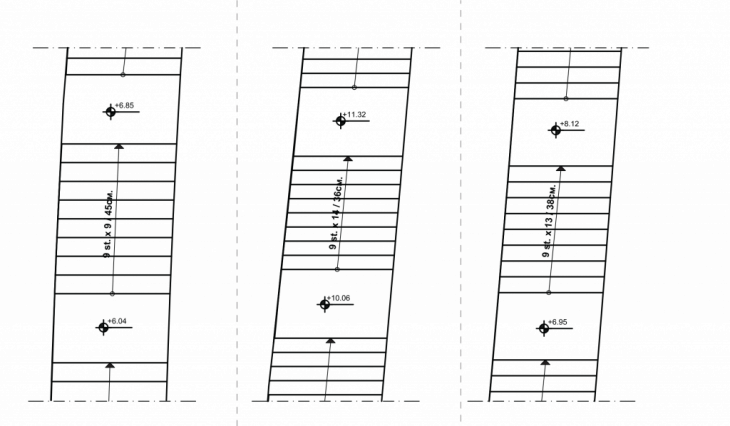 This is why the steps need to be varying in height, depending on the certain position they are placed. Throughout the whole arch the steps have little height and are easy to climb. From the bottom of arch, steps are just 12 cm in height and rising up to 16 cm for the highest ones. 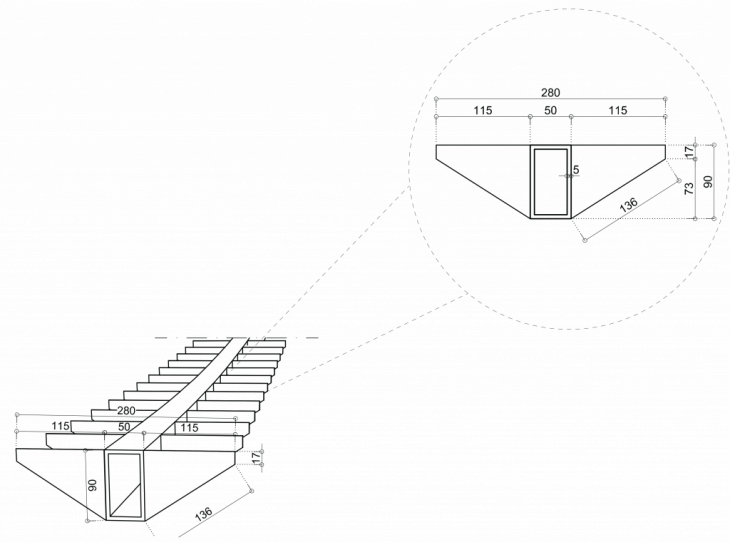 The rests between each set of steps is horizontal and convenient for breaks and taking pictures. Both sides of the staircase is protected with class railings. The bridge is designed, so it can have different interaction with different users, depending on their needs. For the people who want to cross as fast as possible, there are two options to go along both railings of the deck. Those are the two fast tracks. For the second group of people who are willing to interact with the structure, there are curvy alleys with pockets with benches to created hospitable environment to stay, or just to take longer way along the curvy alleys before crossing to the other side. Benches and lounge chairs are available for the users who would like to spend time on the bridge and enjoy the scenery. For the third group of people, who would take the challenge and make the effort to go up the 124 stairs, there would be a beautiful of the whole area to discover. This paper reveals the potential of contemporary bridge structures, showing how they are developing their basic function, creating program and becoming a merging link between two points, thus creating valuable hospitable urban space, that is meant to keep people there. Often bridge positions are of significance for the surrounding area. Bridges have the potential to serve multiple purposes. The potency that the bridge has to host public activities and create a valuable public space, rather than being used solely as a infrastructure link. Bridges begin to be architecture urban element and not an engineering piece. Bridges are point of attraction and we should let them be explored. Realizing the potential, that those urban elements have, can create a better urban atmosphere and high quality public spaces, that no other urban element can host. 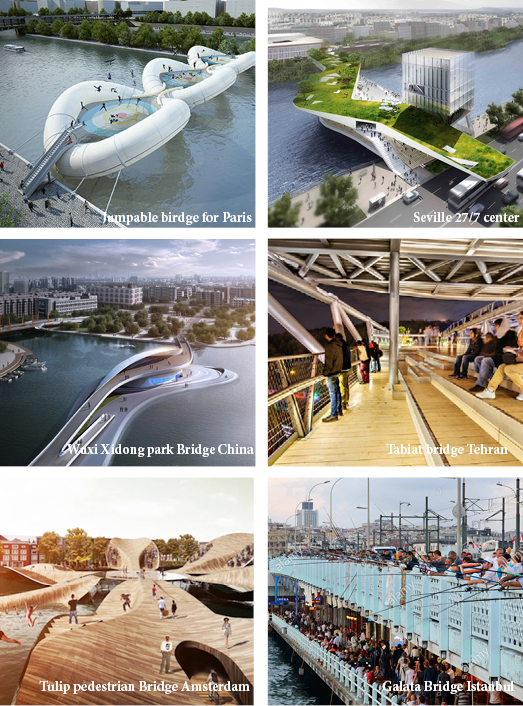 Proposals for new bridges more often include a programmatic space, dedicated to public. 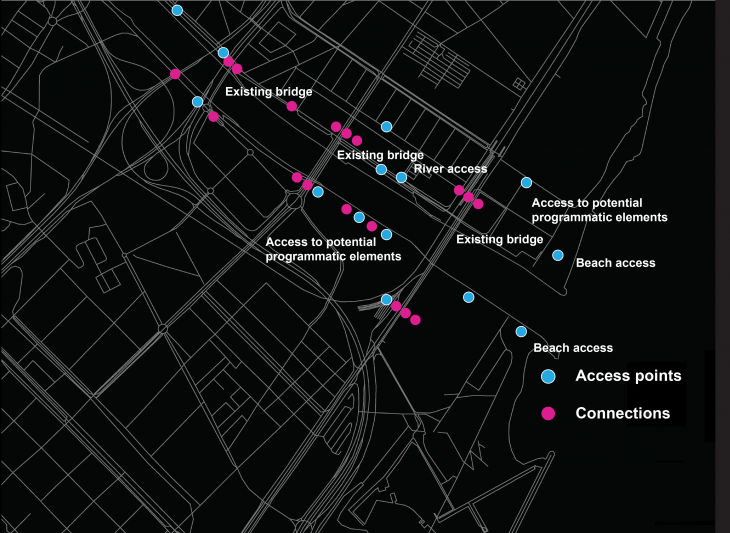 Digital design research and rethinking the purpose of bridges, can not only create new valuable public spaces, but also transform whole areas with multiple bridge connections and create a system of new centrality.